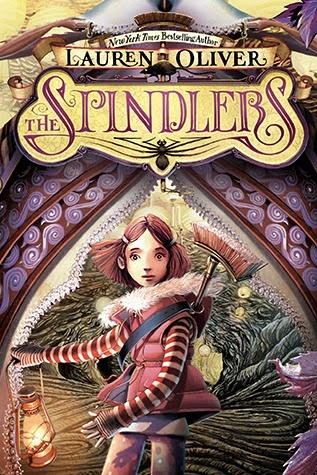 Lauren Oliver's The Spindlers, a middle grade fantasy, is currently available as a free, full-length read on the HarperCollins Children's Books site. That’s where I read it – as part of the Browse Inside feature! I liked Oliver’s first middle grade fantasy, Liesl & Po, so I had been meaning to give The Spindlers a try. Add to that Iacopo Bruno’s cover art (he’s the Italian artist behind the cover for Iron Hearted Violet, as well! ), and I was determined to read the book. Yes, my head was turned again by a pretty cover – and I’m not sorry. Evocative of Alice in Wonderland, this novel from New York Times bestselling author Lauren Oliver is a bewitching story about the reaches of loyalty and the enduring power of hope. Liza is sure that her younger brother Patrick’s soul has been stolen away by the spindlers, spider-like creatures that live Below. She’s sure because her one-time babysitter Anna told Liza and Patrick all about the creatures that live Below, and introduced them to Pinecone Bowling and other games before she went off to college. Liza knows the signs, and she knows that the Patrick living in her house is not the real one. The only thing she can do is to set off on a quest Below to find Patrick’s soul and bring it back Above. On the way she’ll meet an enormous talking rat, and she’ll have to trust, negotiate, and listen in order to make her way to Patrick. And then face the spindlers, of course. On the other hand, many of the adventures before the final showdown were derivative, slow-moving and boring. Mix the awkward pacing in with overly elaborate prose (turns out there’s a fine line between something beautiful and something overwrought! ), and what results is a book that is just okay and leaning-toward-mediocre. That said, I am an adult reading a book meant for children, so I asked myself if I would feel the same way if I picked up this book as a child, if I hadn’t already read Alice in Wonderland, The Lord of the Rings, the Harry Potters, Neil Gaiman’s Neverwhere, or any of the other books that I am quite sure were used to inspire various scenes and creatures. And honestly, I think most of the frustration I felt with the book would go away, except for one thing: the pacing. The middle chapters, while each describing glorious or terrible scenes on Liza’s journey below, are still just scenes. There’s an absence of building tension, and they drag. And I think, unfortunately, that they drag enough that most kids would put the book down. As I said, I felt a lot of different things about this book: frustration, interrupted occasionally by pockets of appreciation and wonder, and then unbridled enjoyment at the very end. It was a mixed bag, reflecting my overall experience with Oliver’s writing: sometimes I love it, sometimes I hate it. In all, an interesting read. Recommended for: fans of Lauren Oliver and young readers who like adventures, fantasy and talking animals. Fine print: I read this book for free via the HarperCollins website. I did not receive any compensation for this review. I want to read Leisl and Po! and yes I definitely enjoy talking animals.